We're sorry you haven't had a chance to upgrade your browser yet and can't see our framed site. We think the frames make it easier to find what you want. If you want to obtain a more current browser, check out either Microsoft's Internet Explorer or Netscape's Navigator or Communicator products! 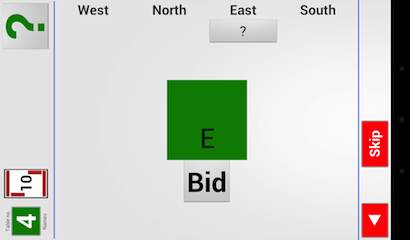 Bidding is an option that enables you to use BridgeTabs for the (entire) bidding. You can watch a short video, and/or try it for free in Dummy mode to see how it works. The BridgeTab is NOT rotated during the bidding as the displayed image is rotated automatically. 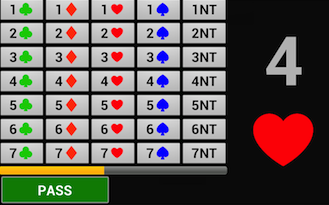 The player in turn to bid is marked by a ? mark in the bidding summary and the “Bid” button. The player in turn to bid should make up his mind BEFORE hitting the “Bid” button. A pause after the Bid button is hit will be recorded as a hesitation. All sufficient bids are presented when the Bid button has been hit. The selected bid (4 hearts in the example) is prominently displayed while the yellow bar shows the time remaining of the 2 seconds grace period. The grace period is intended for corrections of unintentional button presses. A change of a bid after the end of the grace period is recorded (and could lead to a ruling). It is not possible to make insufficient bids when BridgeTabs are used. You can skip the auction and instead enter the contract by hitting the “Skip” button in the footer. A warning message might appear if the auction is not immediately communicated to the server. You can safely disregard (Skip) this warning as the auction will be transferred automatically in the background when communication has been re-established.